Brrrr. Old Man Winter is not done messing with us just yet! At least from a temperature standpoint. Our temperature is currently at a balmy 17 degrees and that is the warmest it has been in over 4 days! I guess that has been good for the preservation of our snow, as well as production of a bit of new snow, but to tell you the honest truth, I am about done with this really cold stuff. I guess I need to point out that it has also been very windy, along with the cold. On Wednesday we had quite the wind storm. It had snowed a bit, but the wind picked up that little bit of snow and really whipped it around. Enough so to cancel school for the day, as well as many other activities. Official wind numbers were 58 mph at the Houghton County Airport, 71 at Stannard Rock in Lake Superior around 20 miles east of Big Bay. The big dog this time was Rock of Ages Light on the southwest end of Isle Royal, where winds were measured at 76. Just to give a perspective of things, a tropical weather feature is classified as a hurricane when its winds reach 75 mph. The shipping season is still on hold, so no freighters were impacted, but I did hear of waves on the big lake as high as 27-29 feet! Those are some biggies! I don’t remember what the theoretical maximum wave height is for Lake Superior (not including rouge waves), but I think it it around 30-35 feet. We lost power very briefly, some for longer periods of time, but I did not hear of anyone in the local area that was without power for too long. It can probably be credited to the fact that we have already had some strong wind storms in the past 3-5 months and they did a lot of the clearing that this storm might have done. Plus, the power companies have been getting very aggressive about cutting back any limbs or trees that would potentially knock out power. So cold and wind has been the main weather story up here this week. We have picked up some light doses of snow. 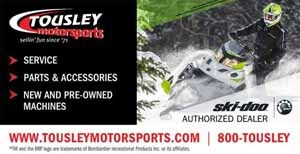 They might be considered heavy in some parts of the country, but 5 1/2″ in as many days is not really a big deal for us. I know I have not concerned myself with moving any of it around, at least the freshly fallen stuff, although I have been busy moving snow of another nature. That snow is what has been covering my “relief” wood pile for this winter. 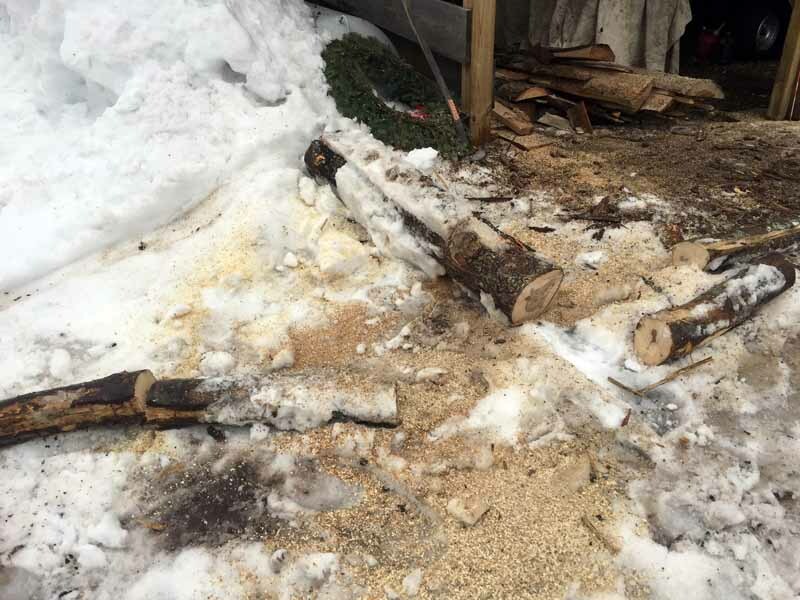 In previous entries, I chronicled how I first ran out of the cut wood, then ran out of the wood that was uncut, but was stacked out of the elements in the woodshed. I was able to get some slabs to get me by for a while and still have a bit of that slab wood left, but it turned out to be quiet wet as well, so was a pain to use without filling the boiler totally up, so that some could burn and the rest could dry out and be ready to burn. So this week, I decided to get to that wood sitting under the pile of snow. Thank goodness for Big Red! In fact, as I was using it to move the snow around and dig out the wood pieces, I thought that I might even title this entry something like Thank goodness for Big Red. 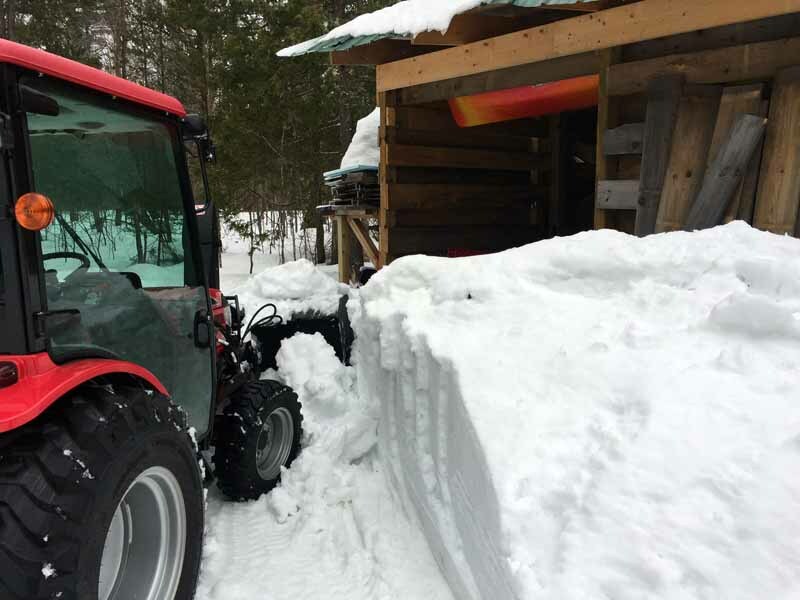 The first job was to clear a path through the snow that had piled up in front of the back opening to the woodshed that was housing the loader arms and bucket for Big Red. So I fired up BR and used the blower to eat away at the bank of snow that was about 4-5 feet deep. It took about 35-45 minutes to eat away at the snow, but the reward was a nice clear path to the loader arms and bucket. With that done, I headed over to Big Reds lean-to and unhooked the blower unit and then drove over and hooked up the loader arms. I am very thankful that no heavy lifting is involved in that process. It is all pretty much a one man job of either inserting pins or pulling pins as well as unhooking or hooking up hydraulic lines. The hydraulics of the machine and implements do all the heavy lifting. Pretty slick if you ask me! 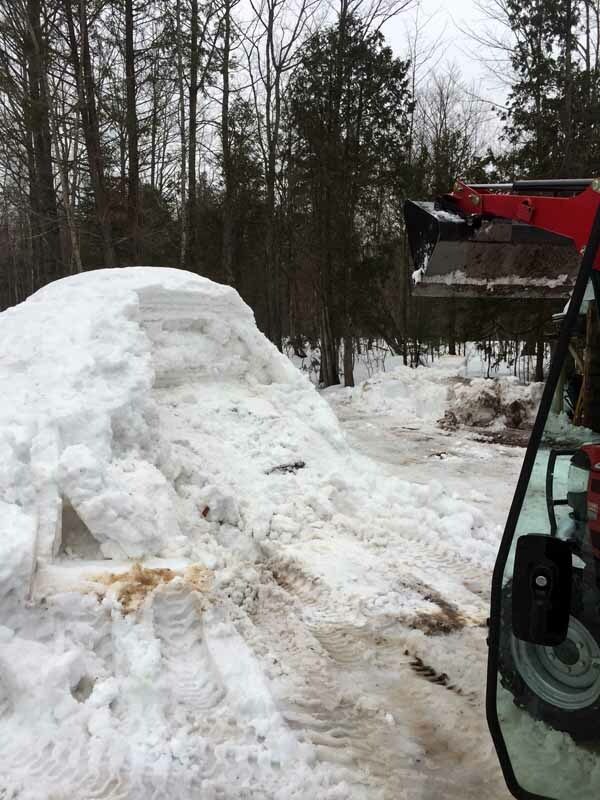 So with the loader/bucket mounted to the front of Big Red, I then just chipped away at the snow that sat on top of it. I did not get out and measure, but would estimate it to be around 4 feet. That should not be mistaken to think that we have 4 feet of snow on the ground. 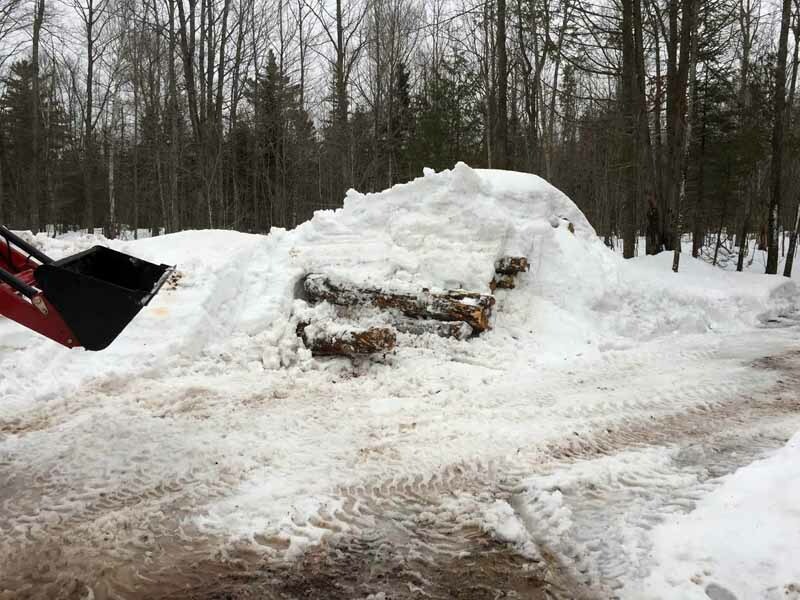 When I clear our driveway and parking area, some snow gets blown where the logs were stacked, so there was some man-made accumulation contributing to the total on the logs. After a bit of work, the first logs started to become exposed. It was getting late in the day, so rather than extracting the entire log from the pile, I just cut a few pieces and put them into the bucket and hauled them over to the boiler to burn and keep us all warm for the night. 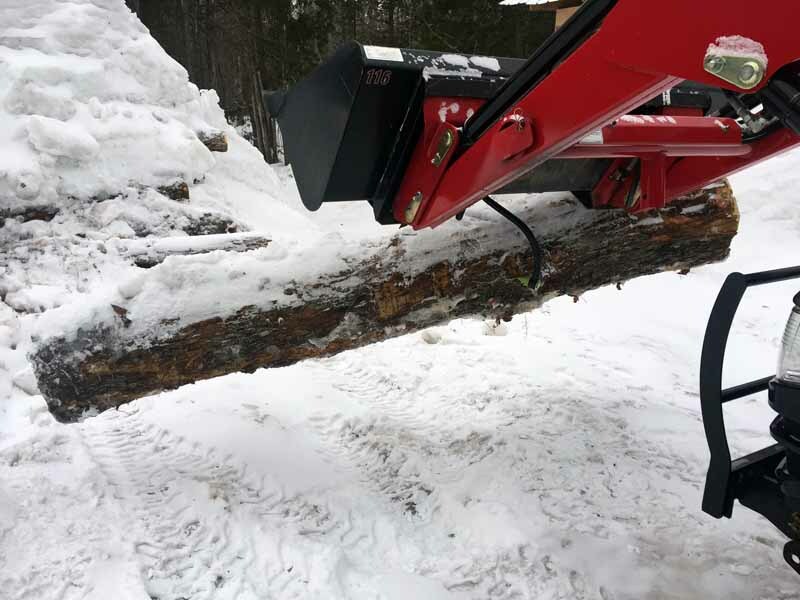 The next day I was able to do a bit more digging and then employed the use of a skidder tong to pick up the logs and haul them over by the wood boiler so that they could be stacked and cut and tossed into the boiler. For a while there, I was beginning to feel like a genuine Northwoods Lumberjack! 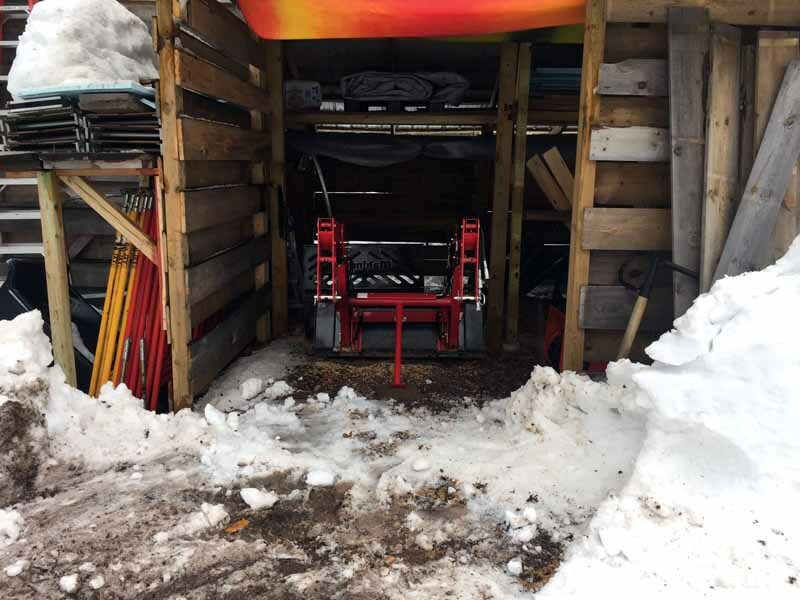 Actually, I was very glad to have all the equipment at my resource to be able to get that wood out from underneath the snow and over to the boiler where it could be cut and tossed in. In my defense about getting into that pickle, it was always in the back of my mind that I would be able to use exactly that process to get to the relief pile if we ran out. Thus, I did not cut enough this autumn that would have left no doubt about having enough to get us through the season. 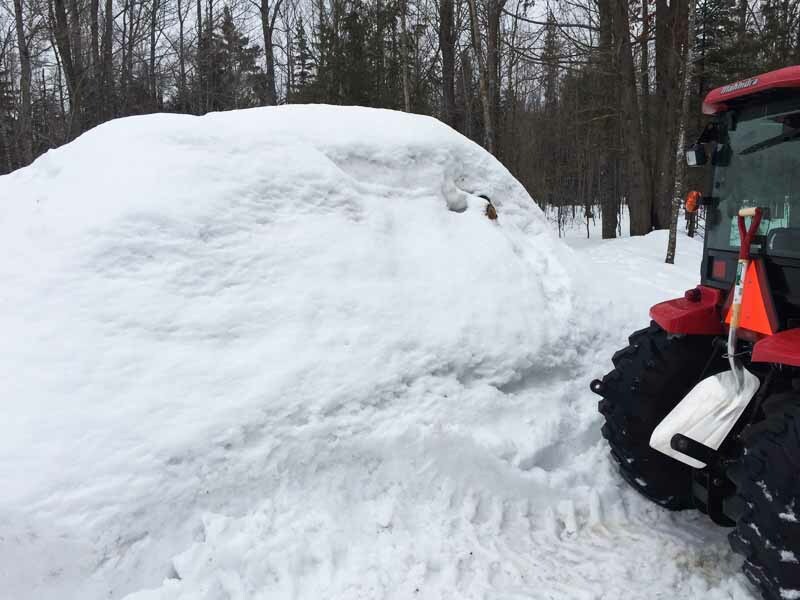 However, even with all the help from Big Red, I am looking forward to some warmer temps to aid in the melting of the snow on the logs as well as making it a bit more comfortable to be out cutting. What will really be nice is when we warm enough that I can stop heating the shops and thus use much less wood. I have already saved up enough money to build a tiny bump-out off the back of the house which will become the new utility room and house a new gas-fired boiler. With a little luck, I will be able to come up with a way to heat the shops without using the boiler and this could be my last season of having to get, cut, stack and burn wood! I guess you could say after around 10 years, it has worn out its novelty. 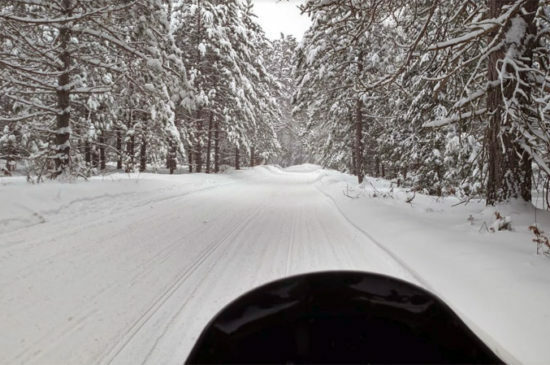 Actually, it is not that bad, but the fact that heating with propane would have cost me as much as heating with wood has make it a bit more difficult to trudge through the snow and cold to load the boiler this winter. Plus, not having to worry about the boiler will free us up when it comes to heading out of town during the heating season. The wood under the snow was put there not long after it arrived and it was cut just a week or two before it was delivered, so it was still quite wet. Burning wet wood in the boiler is not really that big of an issue, as long as you can toss some in before it will be needed to burn. The heat inside the boiler drys it out in about 8-12 hours and it is all good to go. The problem arises in the fact that I have always put in just enough wood to get me through to the next loading time, typically once in the morning and once in the evening. So be still being stuck in my ways of loading just enough wood has created some problems for me. Rather than the wood burning nicely once it is put it, it sort of smolders and at times I have gone out to do the boiler and found it to be quite low in temperature and still pretty filled up with wood, but the pieces of wood were hung up on each other and the ones that were burning burnt out, so I was left with a makeshift bridge of firewood sitting over ashes that were once the burning logs when I last loaded. So it has been a week of me trying to get it through my thick skull to make sure that I load the wood in a manner where it will not prop itself up when the wood below it burns and more importantly, putting in enough that there is an ample supply of dried wood ready to go inside the firebox as well. Thus the issue of trying to teach an old dog new tricks! The cold temps the second half of this week, only made matters worse! 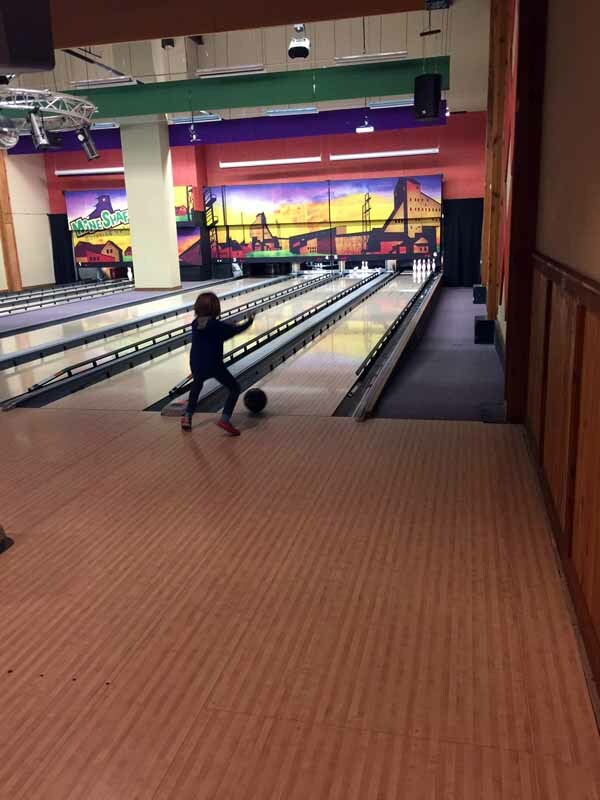 On Friday, we did brave the cold and winds and drove down to Houghton to have dinner and go bowling. It had been quite a while since we all did it as a family and now with my brother living in town, we had four…perfect number to make two teams! So it was Gracie and my brother Jim against Nora and I. They started out red hot and I think by the end of the third frame, not only was Jim beating both Nora and I, but so was Gracie! Nora and I were able to find our stride and there was a bit of falter in Jim and Gracie’s rolls and the “Old Farts” ended up beating the “Young Bucks”. 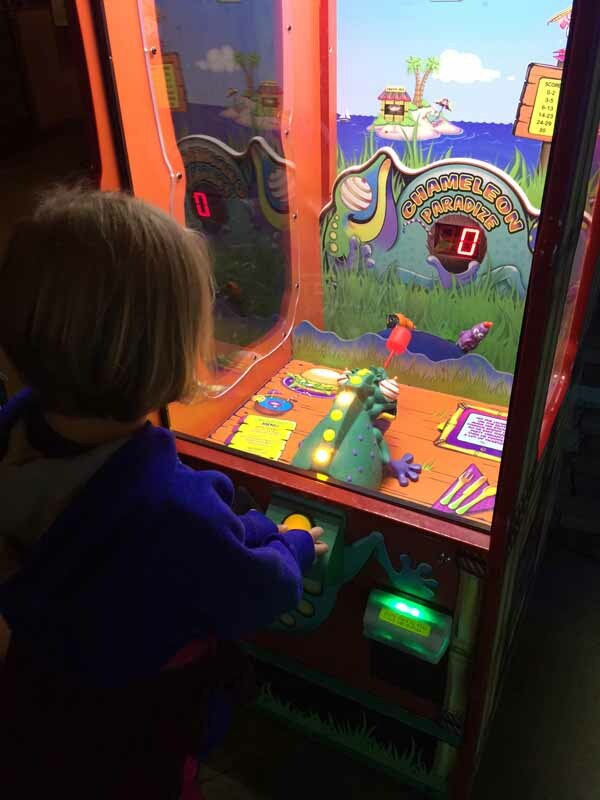 The bowling ally also has a neat arcade game room, so while Nora and I cleaned up our bowling area, Jim and Gracie headed over to play some games and then we joined in on the fun. I’m not sure who had more fun playing some of the games, Gracie or the adults, but fun was certainly had by all! So the forecast for this week sees temps to keep the snow from melting through at least the middle of the week. Not a lot of fresh snow, but maybe an inch or two as a storm passes to our south on Monday. Beyond that it looks like enough of a warm up will occur to at least send daytime highs above freezing. Not a massive meltdown and we might even get a bit of new snow by around Friday, but looking at the date, true winter weather will not likely be hanging around for too long.